Coroner's Officer Carole Hall told Woking Coroner's Court on Friday that he died at the scene despite attempts at resuscitation. The inquest was opened and adjourned to a date to be fixed, pending further inquiries. Ms Hall said the body of the London-born singer had been identified by a relative. "On Tuesday 15 March, he had been at his home in Warlingham where the Met Police were executing a search warrant and he apparently took a kitchen knife and stabbed himself," she said in a statement. "A forensic post-mortem was subsequently conducted by Dr R Chapman, who gave a cause of death as stab wound to the heart." 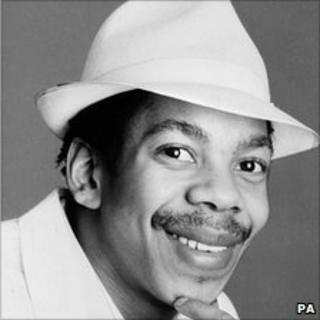 The singer, whose biggest hit was 1984's Police Officer, died when police carried out an arrest warrant at 0700 GMT. Mr Emmanuel, 48, had been due to face trial next week accused of conspiracy to supply cocaine. His family have expressed "deep sorrow and anger" and said they were determined to find out what happened. Merlin Emmanuel said on Thursday: "My uncle David Emmanuel is now dead. He was a father, an uncle, a friend and a mentor to many and is a British icon who died under the most peculiar of circumstances." IPCC Commissioner for the South East Mike Franklin said he understood their concerns and was under no illusion about the seriousness of the case. "Many of the questions that I know Mr Emmanuel's family and friends have are exactly what we will be examining as part of this investigation," he added. The song Police Officer reached number 12 in the UK charts. Smiley Culture's other singles included Cockney Translation and Schooltime Chronicle. Smiley Culture made a cameo appearance in the David Bowie film Absolute Beginners in 1986, and recently featured in the BBC4 documentary Reggae Britannia which explored the rise of UK reggae.